There was a recent question that was posted internally looking for a way to automate the silent installation of VMware Tools for Linux guest operating systems which also required enabling additional VMware Tools features like VMware's Automatic Kernel Modules. Currently, there are two options of installing VMware Tools for Linux guests, the first is by using VMware Tools Operating Specific Packages (OSPs) which can be found here or you can be manually install VMware Tools if an OSP does not exist or if you prefer to install interactively. The solution above is great if you are okay with the defaults. However, if you wish to change any of the default settings such as the location of the installation or enabling additional VMware Tools capabilities, it is definitely not ideal. Unfortunately, as mentioned earlier these are the only two supported installation mechanisms. Now, just imagine you need to roll out a custom installation of VMware Tools and having to perform the installation manually, there must be a way right? Luckily, there is and this is actually a trick that I have used for many installers which require some user interaction. Below is an updated script of performing a silent installation of VMware Tools, but instead of using the defaults I have created an "answer" file which contains the input that you would manually enter and redirecting that into the installer. In this particular case, I have left the system defaults in terms of the paths and documentation of where VMware Tools will be installed and focus on enabling additional capabilities such as VMware automatic kernel modules. You can change these based on your requirements but the current script only enables "VMware automatic kernel modules". I think a great feature enhancement to the VMware Tools installer is the ability to accept a silent configuration file, so that this use case can be better supported and more resilient in case additional options are added. Can this be applied to Darwin (MacOSX) as well? 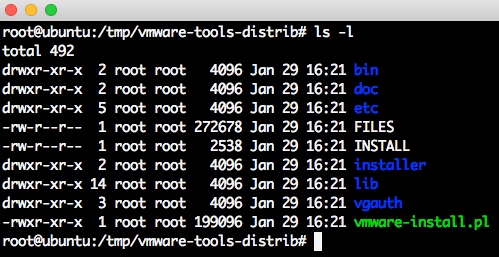 Isn’t apt-get install open-vm-tools easier? Yes, as mentioned if OSP exists and you wish to use that, then it would be. The article is highlighting the fact that an OSP may not exists or if you wish to use the VMware Tools distributed with vSphere, then here’s how you can automate it. Also, using VMware Update Manager, you know all your VMware tools are up to date at a glance. Not so with open-vm-tools. Hi! William, can you give an idea about virtual machine guest authentication use case with an live example. I understand that certain tasks like VMware tools upgrade can be performed. But how I can leverage the functionality? Hi! Kindly share about how VMCI controller we can use? Hi! William, can you give an idea about virtual machine guest user mappings use case with an live example. I understand that certain tasks like VMware tools upgrade can be performed. But how I can leverage the functionality? Great Script ! But this script work for SUSE OS ? can we select Interactive Upgrade Tools Options using Vsphere API. Or is there any option in upgradeTools_Task() API to do so. so how do i get the script file copied onto the VM? copy & paste dont work.